LONDON: When they decided to have a meeting at their party office in the north of the island, the four Sri Lankan MPs probably didn’t expect that it would start raining concrete boulders. Before they knew it, a mob of about 60 people had surrounded the building. After half an hour of sustained assault, the roof broke and the elected representatives found themselves sheltering in the archways of the doors, as if it were an earthquake. All the while the police looked on, doing nothing. At the end, they caught a few of the attackers but quickly released them, including a man who turned out to be one of their colleagues in civilian clothes. “This is not the first or second time this has happened,” said one of the MPs, “it happens all the time and this was just a month ago”. This is the way elected Tamil representatives are treated in a country that claims to be on the road to reconciliation and will soon head the Commonwealth. A Tamil newspaper in the north was recently attacked for the 37th time — its printing press set on fire just 10 days after its distribution staff had been attacked and its request for police protection turned down. Jaffna University students who tried to protest peacefully last November were arrested and bundled off for forcible “rehabilitation”. In March, grieving mothers and wives of the disappeared were prevented from travelling to the capital to stage a peaceful protest. Catholic priests who signed a letter to the UN High Commissioner of Human Rights detailing abuses have been called for questioning and intimidated. This is nothing compared to what some of the ordinary people have suffered. ABC News in Australia just broadcasted the shocking story of a Tamil man who was raped and tortured in Sri Lanka three weeks ago. Equally disturbing is the story of a young Tamil woman who was gang raped for 47 days in custody as recently as last November and the broader pattern of sexual abuse which the Human Rights Watch documented from 75 case histories. An extraordinary film made secretly inside the country by anonymous social scientists has revealed the extent of continuing sexual abuse of former female combatants by soldiers, with a Tamil woman explaining how she was routinely taken to the local army camp and sexually coerced by different men. “There is no will for reconciliation; this is the victor’s peace,” commented Paikasothy Saravanamuttu, who runs the Centre for Policy Alternatives in Colombo. “We have descended into a darkness back home,” he told the Commonwealth Journalists Association in London recently, explaining that the media in Sri Lanka has to “put up or shut up”. 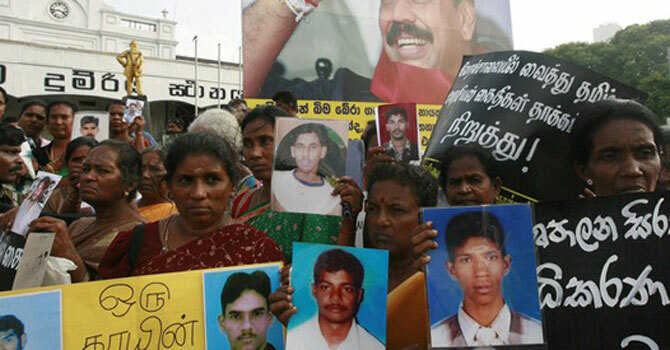 Lack of rule of law has become a problem for everyone in Sri Lanka, not just Tamils. A disturbing new wave of Islamaphobia championed by extremist Sinhala chauvinist monks has seen Muslim businesses attacked with total impunity and drawings featuring pigs and swear words scrawled on mosque walls. Families in the capital who tried to hold a candlelit vigil to protest the attacks on Muslims found themselves arrested and abused. Even the country’s top judge hasn’t received justice. The illegal impeachment of Justice Bandaranayake has been condemned by every possible international legal body. At the launch of a recent International Bar Association report, the author, Sadakat Kadri, said the chief justice’s legal team was given only 12 hours to study 989 pages of evidence. After a day and a half, her accusers had deliberated and written a 35 page report. Kadri said they had “made up the rules as it went along” and he elaborated on a number of conflicts of interest, including nine cases where the new chief justice (a former legal adviser to the government and ex Attorney General) had simply failed to prosecute serious crimes committed against government critics. It is perhaps not surprising that the Commonwealth lawyers’ meeting in South Africa last week unanimously passed a resolution calling for Sri Lanka to be suspended from the organisation — rather than run it for the next two years and host its major summit meeting this November. Nigeria’s former chief justice, Justice Muhammad Lawal Uwais, said the case of Sri Lanka was similar to the coup in Fiji, which the Commonwealth did not allow to go ignored. On April 26, a group of foreign ministers from the Commonwealth known as the Commonwealth Ministerial Action Group will meet in London chaired by Bangladesh. This group is charged with enforcing human rights and democratic principles and yet strangely they don’t even have Sri Lanka on their official agenda. To its credit, Canada will make sure Sri Lanka is raised in the “Other Matters of Interest to Ministers” section and will call for the Commonwealth Heads of Government meeting to be held elsewhere. Many believe April 26 will be a turning point for the 54-nation body — a test of the body’s shared values and recent commitment to institutional reform. If the Ministerial Action Group doesn’t act it will mean the other 53 nations have no problem at all being headed by the only country in the world to have two chief justices, not to mention a state accused by two United Nations reports of war crimes and crimes against humanity. Frances Harrison is the author of Still Counting the Dead: Survivors of Sri Lanka's Hidden War and a former BBC Correspondent in Sri Lanka. Thank you so much for bringing up this topic. What is going on in Sri Lanka is inhuman. World should take notice and correst the situation immediately.